While many substitute Messiahs have been offered, only the True Messiah saves. While we often live for many lords, only one Lord liberates and sets us free from sin and death. While many ways are claimed to bring us close to God, Jesus insists that he is the only way. So we're driven to one ultimate reality: do we believe salvation is in Jesus alone, or do we not. It's our choice. But what we decide about Jesus is really deciding about everything. Is Jesus your Lord? 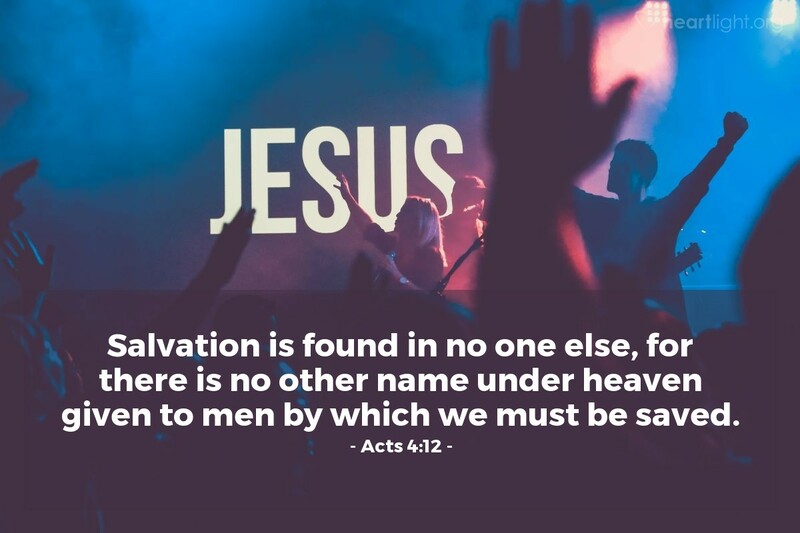 Is Jesus the name above all names in your life? Is Jesus your Savior? If not, then please reconsider, for the Bible says: "Salvation is found in no one else." Thank you, Almighty God, for choosing to share your grace with me in Jesus. May I never take the precious name of Jesus in vain. May Jesus himself come and reign as Lord in my heart and in my life. May Jesus be seen in the way I treat others. May Jesus know that there is no other rival for my allegiance to him. In that precious name of Jesus, your Son and my Savior, I pray. Amen.